Want to improve your English? 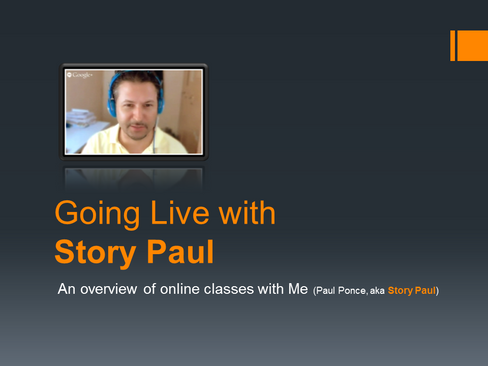 Join me for online coaching sessions via Google Hangout, Skype, Zoom, Facetime or WeChat. My sessions are engaging and effective! Master the art of conversation. I will show you how to master the speaking patterns of native English speakers. Find out more about GOING LIVE with me here. Join me for One-on-One Online English coaching designed for anyone who needs to attend a job interview or make a presentation in English. Find out more about GOING LIVE with me here. You and a group of friends or colleagues join me for Online English coaching personalized to the group's needs. Find out more about GOING LIVE with me here. SIGN UP for Online Coaching with me here. Get an OVERVIEW of Online Coaching with me here. StoryPaul is an international partner of English Attack, the world's first entertainment learning platform where you can learn English with movies, music and games. Click & get your FREE account today!